Winning the Email Hero Award for Best Subject Line, this week we’re featuring Frontier Airlines! 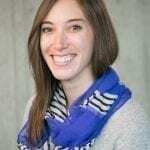 The subject line can make or break an email campaign. No matter how great the offer inside the email may be, it’s useless unless its subject line is able to entice the subscriber to open. 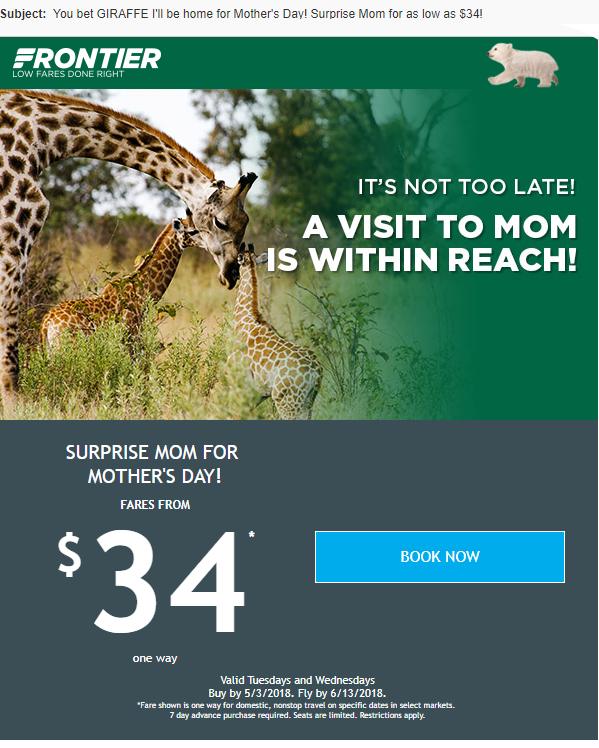 Faced with a limited timeframe, Frontier Airlines was able to increase their Mother’s Day bookings with a well crafted subject line. To understand what went into this award-winning campaign, we interviewed Mattes Hannigan, Marketing Coordinator at Frontier Airlines. What were the goals of this particular campaign?The goal with this email was to generate last minute bookings for mother’s day travel and future travel bookings using the unique subject line: “You bet GIRAFFE I’ll be home for Mother’s Day! Surprise Mom for as low as $34”. The main challenge was a short booking window for travel in the target period and audience fatigue with travel offers during this time. This campaign achieved the goals of engaging customers and driving bookings for the desired time period. In particular, The subject line was successful in engaging customers and provided a 31% open rate which was a full 10 percent increase over the average open rate of 21 percent. We use ReturnPath very extensively during the creation of all email campaigns. For this campaign specifically, we relied heavily on IP Certification and Reputation Monitor to place our messages high and avoid spam traps on a highly competitive day for email offers. In doing so, we were able to get our Mother’s Day message across to users with a 31% open rate, outperforming our average open rate by 10%. We also focused on the quality of the offer, dramatic design and positioning, and a sense of urgency with our time-sensitive promotion.